Approximately 500 people ventured to the EOD Memorial Wall this year, as 12 new names were added to the engraved lists that now contains 338 people. The 2018 event marked the ceremony’s 49th year. EGLIN AIR FORCE BASE, Fla. — Dressed in the bright whites, deep blues and dense blacks of their service uniforms, Airmen, Marines, Sailors, and Soldiers came together once again this past week to honor and remember their fallen explosive ordnance disposal brethren during the annual memorial ceremony at the Kauffman EOD Training Complex here. The schoolhouse’s commander, Navy Capt. Charles Andrews, welcomed the EOD technicians, family and community to the ceremony and explained why they were drawn back to memorial each year. Lt. Gen. Michael Shields, director of the Joint Improvised-threat Defeat Organization, the ceremony’s guest speaker, shared heartfelt sentiments to the families of fallen technicians in attendance. He recounted the heartbreaking stories behind each of the new Soldiers’ and Sailors’ names added this year. Each year, a wreath is placed in front of each branch of service’s list of names before they are read aloud. After each list is completed with the phrase “We remember,” and the names are saluted by an enlisted and officer EOD member. 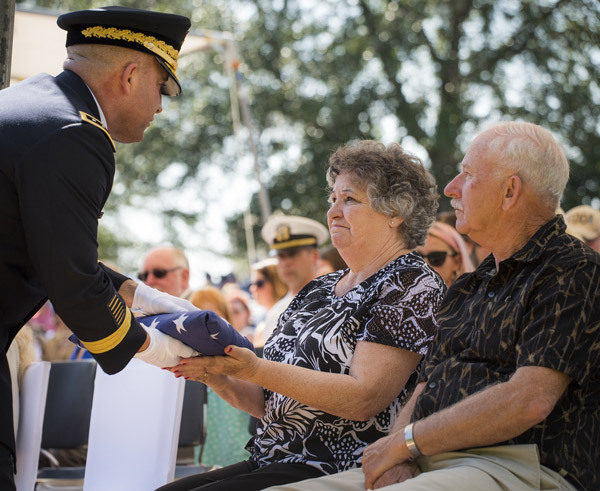 The families of the EOD technicians added to the wall each year receive a folded flag that was flown over the memorial. PHOTO (TOP): Command Master Chief Petty Officer Michael Riggs removes the cover from a new name added to the Navy’s side of the memorial wall during the 49th Annual EOD Memorial Service.